Exercise is great, but when combined with a healthy eating regime you are on your way to an even better, healthy and happy lifestyle. The Nutrition plan is designed around your culinary and ethnic preferences. I look at your food diary and develop a nutrition plan that your taste buds will love and enjoy. Don’t worry about your treats, you don’t have to give most of them up, but just eat them in moderation. I will work with you to help you achieve your goals – whether it is to lose weight or to start a healthier lifestyle. No need to guess what meals to eat, a variety of option shall be provided for you. Your nutrition plan will list the best way to eat right. You will know what foods boost your energy levels, what foods keep you full for longer and more. 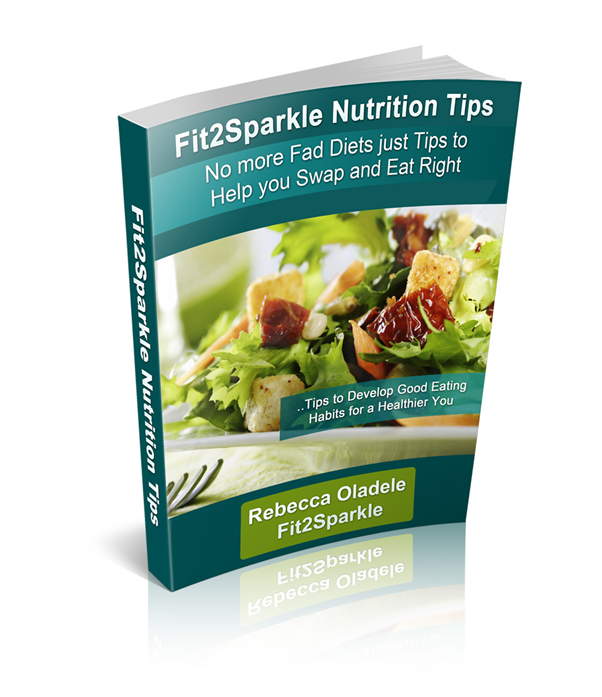 You will learn how to swap NOT stop the foods you love. You will lose fat and feel great. A healthy diet has been proven to prolong life and reduce the risk of diseases and common illnesses by eating the right food at the right time. FOOD2SPARKLE RECIPES: 100 tasty recipes for a healthy lifestyle all year round. 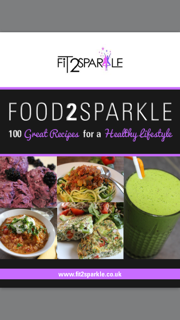 The Food2Sparkle 100 Recipes eBook is the ideal companion for your healthy lifestyle. Stop the fad diets and stop trying to lose weight and gain it right back again using unsustainable methods. There is a better way to stay fit and healthy; this recipe eBook is a must-have and should always be within reach in your home. Most recipes are dairy free. In the majority of recipes where dairy is present, I also recommend a dairy free substitute. For example dairy free yoghurt, this can be easily obtained in UK supermarkets and increasingly around the world. All recipes are Gluten, Wheat and Alcohol Free. They are also free from refined sugar. Sugar appears in the form of fruit and honey. In some of the ‘Treat’ recipes, I have used a plant-based sweetener called stevia or coconut sugar. I do emphasise that these recipes are ‘Treats’ and should be consumed in moderation.